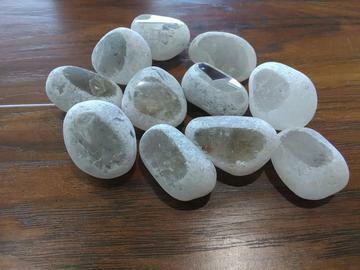 Smoky Quartz Seer Stone with a grey polished flat face and frosty white on the sides. Seer stones are also known as Window Crystal, Dreamer's Crystals and Emma's Egg. "Looking" through the window of the crystal reveals a world of wonder in the quartz inside. Smoky Quartz is the most efficient grounding and anchoring stones and at the same time raises vibrations during meditation. Smoky Quartz is also a protective stone and creates a strong link with the base chakras. Smoky quartz facilitates moving between alpha and beta states of mind and aids clearing the mind for meditation. Size Range: 1" - 1 1/2"